Irish nationalists are attempting to secure the independence of their country. The military strand of this struggle is still relatively dormant, with the ambush at Soloheadbeg in January not being followed by a general escalation in violence. However disturbances are still occurring, with a recent example being the killing of magistrate John C. Milling in County Mayo; his judgements had imprisoned members of the Irish Volunteers. The political strand of the independence struggle is currently centred on Dublin, where Dáil Éireann, the self-declared Irish parliament, is meeting. Following De Valera‘s escape and the release of other leading Sinn Féin members, the party is now in a position to revitalise the Dáil government. Yesterday the Dáil approved De Valera’s appointment as prime minister and today it approves his cabinet. Michael Collins, who led the operation to break him out of jail, becomes the Minister for Finance, charged with rustling up money to keep the fledgling state apparatus running. And Constance Markievicz is appointed Minister for Labour; she is already the first woman elected to Britain’s House of Commons and now she is the first woman to hold ministerial office in a modern democracy. In Ireland members of Sinn Féin elected to the British House of Commons have assembled in Dublin, proclaiming themselves to be Dáil Éireann, the parliament of a free Ireland. They have attempted to gain international support for their struggle for Irish freedom, with mixed success. The US House of Representatives has passed a resolution supporting Irish self-determination, but attempts to make Ireland’s case at the Paris Conference have unsurprisingly been blocked by Britain and its Allies. For now the British response to Sinn Féin’s efforts are relatively restrained; the authorities perhaps hope that if they leave Dáil Éireann alone it will fade away into irrelevance. British policy can at times even be conciliatory. Sinn Féin leader Éamon de Valera recently escaped from jail in England, but perhaps the drama of that affair was unnecessary. Today the British release many of the Sinn Féin leaders they had arrested last year on foot of involvement in an imaginary German plot. Griffith, Markievicz and others are now on their way home. Whether their return will calm Ireland or further vitalise Sinn Féin’s struggle remains to be seen. Influenza is continuing its march across the world, snatching life even in places that were barely touched by the war. The great and the meek alike are its victims (President Alves of Brazil has recently succumbed) but it is cutting a particular swathe through the ranks of the poor, who are often already weakened by poor diets and live in overcrowded conditions that are ideal for the virus’s transmission. In Ireland a third wave of the pestilence has arrived. The Irish Times reports today on a shocking incident that recently occurred in Dublin. Neighbours of Frances Phelan noticed that she and her family had not been seen for some time. Breaking into the family’s apartment, they find Mrs Phelan dead in a bed, with her husband, son and sister-in-law huddled around her, all dying of the flu. Scenes of horror like this are being repeated all over the world. 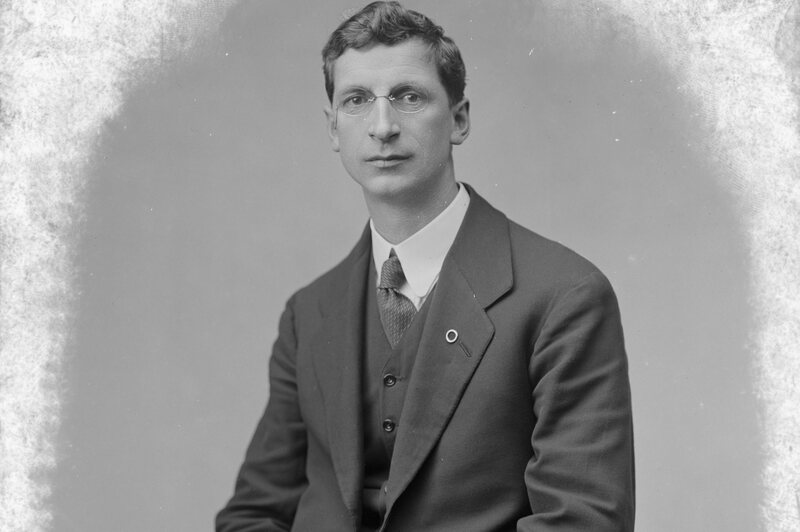 Éamon de Valera is the leader of Sinn Féin, the radical Irish nationalist party. Since last May he has been under arrest, rounded up with other Sinn Féin leaders on suspicion of involvement in an imaginary German plot to invade Ireland. De Valera is being held in Lincoln Jail in England, but is keen to escape and return to Ireland. And his comrades at home are keen to set him free. Hidden in a cake they send de Valera a blank key and a set of files. With the aid of another prisoner, de Valera creates a master key. Tonight he and fellow Republicans Sean McGarry and Sean Milroy let themselves out of their cell and then through a door to the outside world in the prison’s exercise yard. 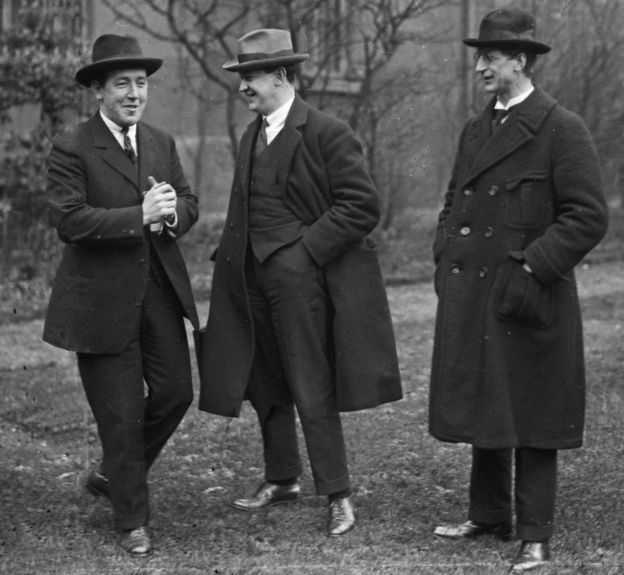 Waiting for them are fellow revolutionaries Michael Collins and Harry Boland, who whisk the fugitives away to a safe house. Soon they will be transported to Ireland, where de Valera will be able to resume his leadership of Ireland’s struggle for independence. Sinn Féin won 73 of 105 Irish seats in the recent general election. True to their pre-election promises, they have not travelled to London to take their seats in the House of Commons. 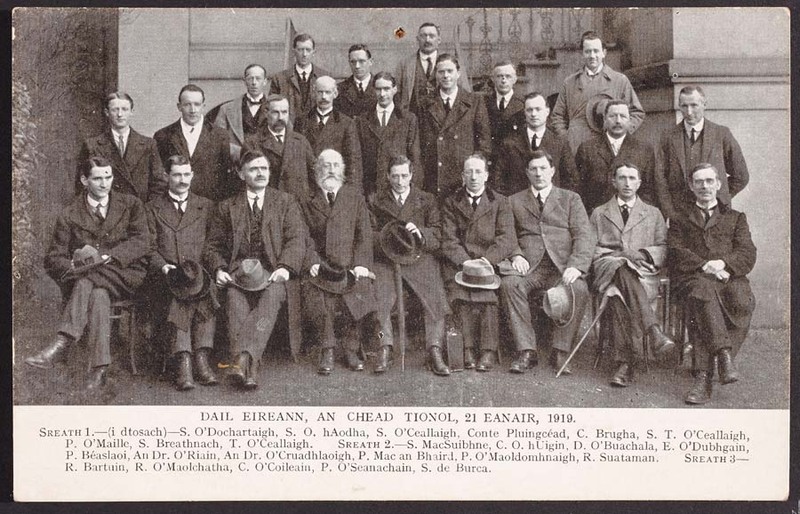 Instead those of them who are not in prison or on the run assemble today in Dublin, proclaiming themselves to be Dáil Éireann, the sovereign parliament of an independent Irish nation (the other 32 men elected from Irish constituencies are also invited to attend, but none of them choose to do so). 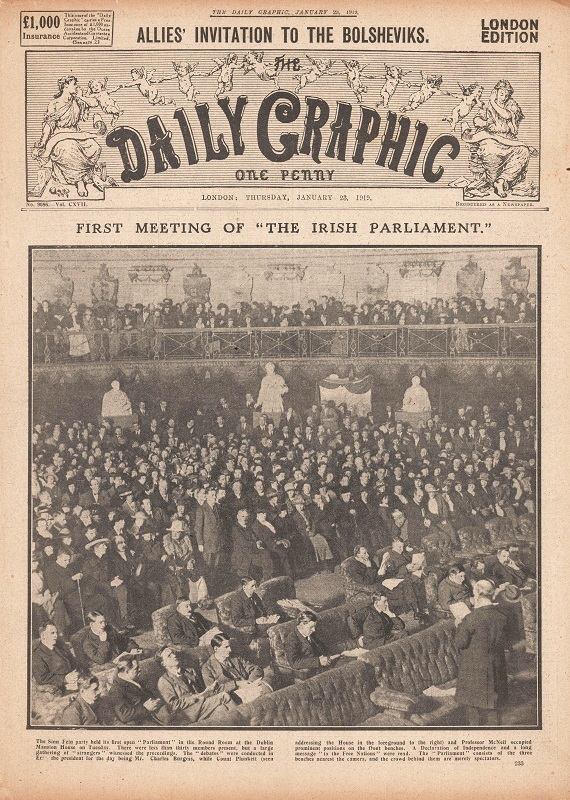 The first meeting of Dáil Éireann is an event of political theatre. Proceedings take place in the Irish language. As the roll is read, members absent because they are in jail are recorded as being “fé ghlas ag Gallaibh” (imprisoned by the foreigners). Two key documents are read out in French and English as well as Irish: a Declaration of Independence and a Message to the Free Nations of the World, which seeks support for Irish independence. The Democratic Programme of the Dáil is also read out, a statement of progressive political aims largely drafted by Thomas Johnson, leader of the Irish Labour Party. Labour had chosen not to contest the 1918 election and the Democratic Programme’s proclamation is a quid pro quo for its leaving the field clear for Sinn Féin. The members of Dáil Éireann hope that their parliament will become the parliament of a nation that is independent in fact as well as in aspiration. They hope also that this independence will be achieved through political means. However the parliamentarians are not the only people working towards Irish independence. The Irish Volunteers (whose members staged the 1916 Easter Rising in alliance with the Irish Citizen Army) still exist as a paramilitary force dedicated to achieving Irish independence. Many leading members of Sinn Féin are also members of the Irish Volunteers (increasingly referred to as the Irish Republican Army) but the relationship between the two organisations is complex. While the politicians meet in Dublin, a unit of the Volunteers in Co. Tipperary prepares to strike a more violent blow for Ireland. Acting on their own authority and commanded by Séamus Robinson, these Volunteers ambush two policemen escorting a consignment of gelignite to a quarry at Soloheadbeg. The policemen, James McDonnell and Patrick O’Connell, are shot and killed, the first victims of this new phase in the struggle for Irish freedom. Ireland voted on 14 December as part of the United Kingdom’s first general election since 1911. Today the votes are finally counted and the results reveal that Sinn Féin has definitively supplanted the Irish Parliamentary Party as the voice of Irish nationalism, with the IPP winning just 6 seats to Sinn Féin’s 73. John Dillon, the IPP’s leader, loses his East Mayo seat to Sinn Féín leader Éamon de Valera, who is currently in prison in England after being arrested earlier this year on suspicion of involvement in an outlandish German plot to invade Ireland. Unionist parties meanwhile dominate in the north east of the country, where many Protestant voters fear the consequences of self-rule in mainly Catholic Ireland. This is also where the Irish Parliamentary Party wins most of its seats; IPP candidates are more used to battling on against adverse circumstances here. 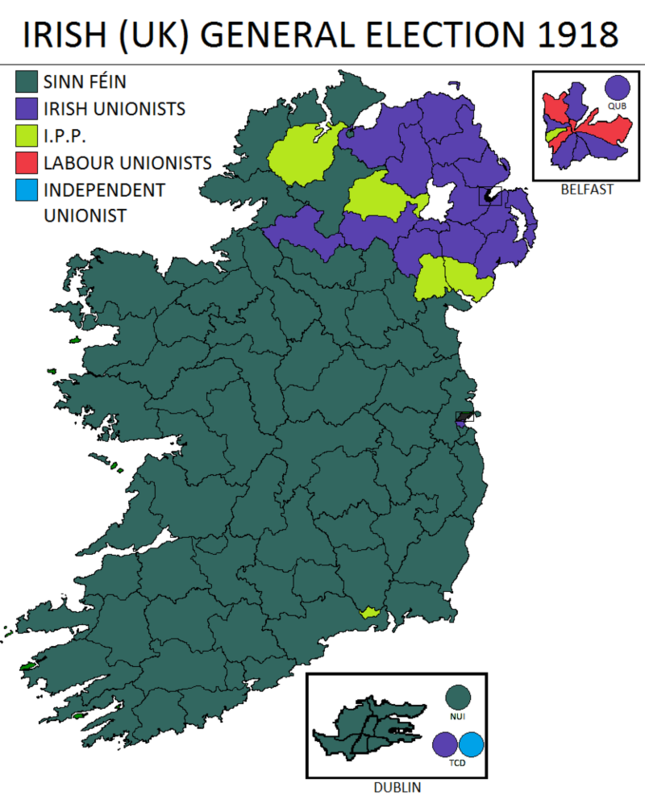 Apart from the north east, the electoral map of Ireland is now a sea of dark green, representing Sinn Féin victories. The only exceptions to the Sinn Féin sweep are Waterford City, where William Redmond is elected to the seat previously held by the late John Redmond, his father and the former leader of the IPP, and Rathmines in Dublin, where Unionist candidate Maurice Dockrell is elected. Two women ran for Sinn Féin and one of these, Constance Markievicz, is elected. Like De Valera she played a leading role in the 1916 Rising and like him she is also currently in jail in England. Sinn Féin candidates have secured election on an abstentionist ticket: they have promised not to take their seats in Westminster but instead to assemble as an Irish parliament in Dublin. Now those elected Sinn Féin representatives who are not on the run or in jail prepare to meet in January as the first sitting of a sovereign Irish parliament, to be known in the Irish language as Dáil Éireann. Two weeks ago the United Kingdom held its first election since 1911. Because of the large numbers of postal ballots from men serving overseas with the armed forces, the votes are only counted today. And the result is a landslide victory for the Conservatives and Prime Minister Lloyd George‘s faction of the Liberals. 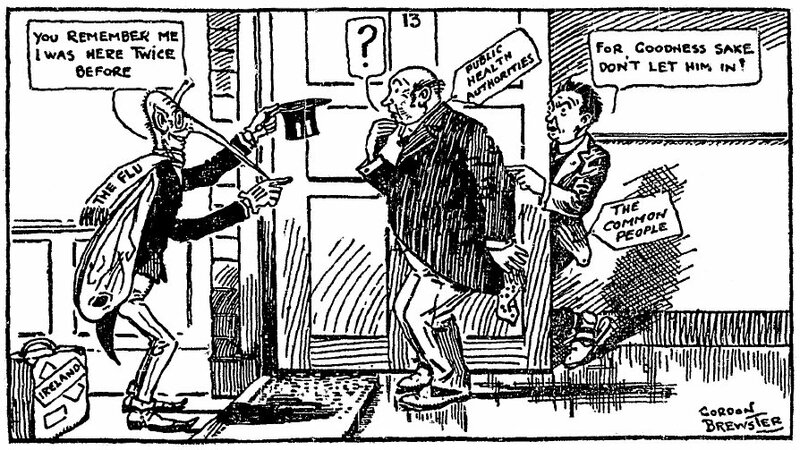 Lloyd George has just led the country to victory against Germany, so it is perhaps not too surprising that voters have rallied to him and his Conservative allies. Asquith‘s faction of the Liberals win an impressive number of votes (only slightly less than Lloyd George’s) but lose most of their seats; Asquith himself fails to secure re-election. Aside from the coalition’s popularity, Asquith suffers from his own association with the less successful early years of the war. His long opposition to votes for women may also have counted against him now that women are voting for the first time. Labour meanwhile win more seats than the Asquith Liberals and substantially more votes than Lloyd George’s Liberals; although they are only the fourth largest party in parliament, their power is clearly on the rise. Although women now have the vote, the election is not a particularly successful one for women candidates. Christabel Pankhurst, a leading suffragette, narrowly fails to secure election and is defeated by John Davison of Labour. The only one of the sixteen women’s candidates elected is Constance Markievicz of Sinn Féin. Markievicz stood on an abstentionist ticket and is currently in jail, so she will not be taking her seat in the House of Commons. Markievicz was elected in Ireland. The results there have followed an entirely different pattern to the rest of the United Kingdom.